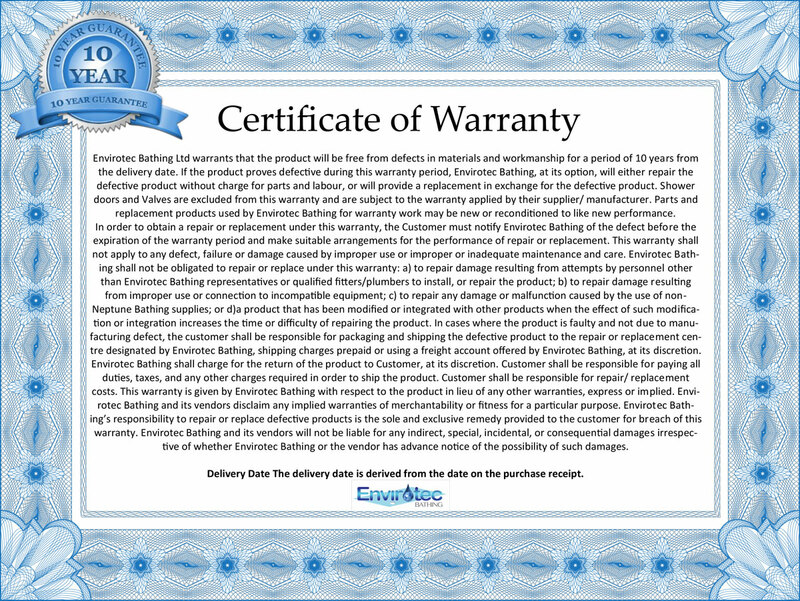 Certificate of Warranty Envirotec Bathing Ltd warrants that the product will be free from defects in materials and workmanship for a period of 10 years from the delivery date. If the product proves defective during this warranty period, Envirotec Bathing, at its option, will either repair the defective product without charge for parts and labour, or will provide a replacement in exchange for the defective product. Shower doors and Valves are excluded from this warranty and are subject to the warranty applied by their supplier/ manufacturer. Parts and replacement products used by Envirotec Bathing for warranty work may be new or reconditioned to like new performance. In order to obtain a repair or replacement under this warranty, the Customer must notify Envirotec Bathing of the defect before the expiration of the warranty period and make suitable arrangements for the performance of repair or replacement. d) a product that has been modified or integrated with other products when the effect of such modification or integration increases the time or difficulty of repairing the product. In cases where the product is faulty and not due to manufacturing defect, the customer shall be responsible for packaging and shipping the defective product to the repair or replacement centre designated by Envirotec Bathing, shipping charges prepaid or using a freight account offered by Envirotec Bathing, at its discretion. Envirotec Bathing shall charge for the return of the product to Customer, at its discretion. Customer shall be responsible for paying all duties, taxes, and any other charges required in order to ship the product. Customer shall be responsible for repair/ replacement costs. This warranty is given by Envirotec Bathing with respect to the product in lieu of any other warranties, express or implied. Envirotec Bathing and its vendors disclaim any implied warranties of merchantability or fitness for a particular purpose. Envirotec Bathing’s responsibility to repair or replace defective products is the sole and exclusive remedy provided to the customer for breach of this warranty. Envirotec Bathing and its vendors will not be liable for any indirect, special, incidental, or consequential damages irrespective of whether Envirotec Bathing or the vendor has advance notice of the possibility of such damages. Delivery Date The delivery date is derived from the date on the purchase receipt.